How do you rethink marketing strategy and operations with these new technologies? How do you harness these technologies to craft amazing customer experiences? How do you enable agile IT and marketing collaboration at an operational level? How do you build the right kind of technology management into the marketing team? How do you connect the dots between different tech-powered marketing capabilities? How do you prepare for “what’s next” on the marketing technology horizon? The answers to those questions inherently cross boundaries. If those are questions that you’re interested in — no matter what your role is in marketing, technology, or a hybrid blend of the two — then our mission with this upcoming MarTech is to make it one of the best conferences you could possibly attend. Of course, the primary boundary that we aim to cross is the line between marketing and IT. Our speakers come from a wide range of backgrounds and positions in marketing, IT, software development, and digital agencies. Most are pioneering hybrids, quintessential marketing technologists, who have blended these different disciplines into “a new brand of marketing.” Whether your strengths are more on the technical side or the marketing side, our goal is to help you better harmonize the two. But the anachronistic gulf between marketing and IT is just one dimension we’re remixing. Many conferences tend to cater to either executives or operating practitioners, but not both. Our intent with MarTech is to pollinate across that divide too. I believe that in this software-saturated environment, marketing executives should understand the key dynamics of the technology twisting like a tornado through their department. It’s not that every CMO has to become technical. But they should know how these new capabilities actually work in practice — or what causes them to flop — and the implications for reshaping marketing strategy and management accordingly. The same goes in the other direction too. 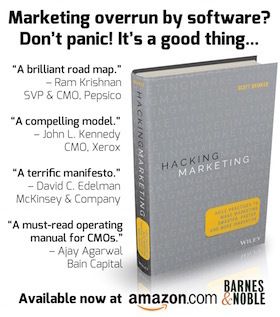 Marketing technology is a vehicle for distributed leadership. It gives front-line marketing staff tremendous power to act and react quickly — if they’ve been given the prerogative by management to do so. This is the essence of marketing agility. But as they say, with great power comes great responsibility. It’s more important than ever for those front-line marketers and mid-level managers to have clarity about how their contributions connect with the bigger picture. We crafted the agenda for MarTech to be an exchange of perspectives across those layers. You’ll hear from CMOs, VPs, directors, managers, and program leads — each to illuminate technology-powered marketing from a different angle. You’ll also notice that the program contains a mix of B2B and B2C companies. While there are certainly differences between those two worlds, we believe that they increasingly have more in common and enormous potential to learn from each other. They both are now building digital relationships with individual customers — not faceless organizations, not anonymous buyers in a distant channel, not generalized personas on the wall. Breakthrough ideas don’t just come from your immediate peers — those companies who look a lot like yours — but from the “adjacent possible” of very different firms tackling analogous challenges. Those are the sparks of inspiration that we’re looking for across our B2B and B2C participants. First, there is absolutely zero intermingling between sponsorships and the program content. With very few exceptions, most of the speakers are not associated with marketing technology companies. None of them, however, paid to be on stage. While we have a very vibrant exhibit hall, that was sold and managed by a completely separate team from those of us doing the programming. Second, almost all of the presentations are solo speaker, 20-minute TED-style talks. I believe this is the most effective format to communicate an idea with the right balance of depth and brevity. I’m not a big fan of panels. They often give the illusion of a bigger program — there are more names and logos on the speaker roster — but the substance can fall short. We will have three fireside chats, 45-minutes each, but I will personally run them as a conversation with 2-3 special participants, for topics where it seems like a candid, unscripted discussion will be more revealing than a rehearsed speech. At least for this MarTech, we will keep this as a single track conference experience. As with the decision to avoid panels, this limits the total number of topics we can cover in two days. But I believe it creates a better opportunity for bonding among the attendees, who will all share the same content as seeds for discussion. Marketing technology applied to customer experience. The evolving marketing technology landscape. In this first bundle, we’ll focus on how companies manage marketing technology — and the effects that marketing technology can have on marketing management more broadly. We’ll hear two different stories of constructing a new marketing technology capability in an organization from the ground up. The first will be from Joseph Kurian, Head of Marketing Technology & Innovation at Aetna. He’ll describe the case he made for launching a marketing technology and innovation group within a Fortune 100 enterprise, crafting a different charter than existing marketing and IT teams. He will share how the group grew, how he developed the team, and a glimpse of the roadmap they have for the future. For a bit of a preview, you can read this Q&A I did with him last year: Aetna’s team of marketing technologists: don’t call them shadow IT. The second story of creating a marketing technology function from scratch will be from Saad Hameed, the Head of Marketing Technology at LinkedIn, describing how their marketing technology function was birthed in a very different environment — a company without a traditional IT department and a very diverse set of requirements across consumer marketing, B2B marketing, and e-commerce marketing. Based on his experience, he’ll share a process-driven framework for determining technology needs, prioritizing them, and sequencing their adoption in project phases. Again, for a sneak peak of his perspective, here’s a Q&A I did with him last year as well: More unicorns! LinkedIn’s head of marketing technology. I think it will be fascinating to compare and contrast their experiences. The importance of establishing a marketing technology blueprint — taking the leadership steps necessary to avoid the infamous “frankenstack” — will be a topic that Cynthia Gumbert, the VP Digital and New Accounts Marketing at CA Technologies will dive into more deeply. Cynthia will share a blueprinting technique that she’s used for visually telling the story of the current and desired state of marketing, and how to map the journey from vision to delivery. This isn’t just a tool for marketing technology planning. It’s a way to help the larger marketing team visualize the interactions between their processes and systems — and to better identify tech-related challenges and opportunities across the department. And that’s just the first hour and a half of Day 1. Later that morning, Patrick Spenner, the Managing Director of CEB’s marketing practice, will share key insights from their research and engagements with many leading brands around changing the “soft” aspects of marketing — people, ways of working, and culture — to unlock the real potential of marketing technology. “Bolting on” technology to legacy systems and processes doesn’t cut it, which is one of the reasons that most marketing technology is woefully underutilized. Ironically, the soft changes are probably the hardest. But to close the gap between consumers’ digital sophistication and marketing’s, these are the changes we have to tackle. Patrick will help show you how. Tony Ralph, the Director of Ad Technology at Netflix, will share the management approach they took in bringing programmatic advertising in-house. This will offer both a deeper look at how adtech and martech are being connected in practice, as well as a concrete example of how Netflix applies rapid iteration, rigorous testing of bold hypotheses, and smart risk-taking in the design and operation their marketing technology stack. Thomas Stubbs, the Global IT Leader of Digital Marketing at The Coca-Cola Company, will guide the audience through a case study of one of the company’s most recent global marketing technology projects — and how they brought together marketing and IT to create a truly memorable digital and real-world experience for its brand. Isaac Wyatt, Marketing Operations Manager at New Relic, will dive into the parallels between marketing automation and engineering — and perhaps an analogy between marketing operations and DevOps as well. This provides a rich set of metaphors for how to design and manage automated and programmatic marketing programs, drawing upon decades of concepts and best practices from the software development community. Fred Gerantabee, SVP and Director of Creative Technology at Grey Group — a WPP company that is one of the ten largest advertising agencies in the world — will provide a view into the evolution of marketing technology management in modern creative agencies. He’ll explore the growing role of creative technologists in large agencies, and how their work with technology platforms, connected devices, and software and data partnerships are helping to solve big brand challenges. He’ll also share how they’re using agile methodologies and prototyping models to facilitate rapid delivery and greater cross-disciplinary thinking. Finally, as a culmination of our marketing technology management topic, Jonathan Martin, the CMO of EMC, and Rishi Dave, the CMO of Dun & Bradstreet — two terrific digital marketing leaders — will join me for a 45-minute fireside chat on How Martech Makes the CMO the Champion of Company-Wide Transformation. We’ll have a candid conversation about “refactoring the marketing department,” including how it’s internally structured and how it interfaces with other departments — especially IT, sales, and finance. How have these CMOs framed marketing’s technology management role? How do they govern it? How has it affected their mission at a strategic level? We’ll tackle some of the hard questions around culture and change management to make that happen. In the second bundle of topics — and remember, as a single-track conference, all attendees will get to participate in all sessions — we’ll look at how marketing technology is being applied to craft better customer experiences. Mayur Gupta, the Global Head of Marketing Technology & Innovation at Kimberly-Clark — a true pioneer and thought-leader in the marketing technologist community — will share his latest thinking on putting the human in your marketing technology stack. Concerned that it can be all too easy for marketing technology initiatives to lose sight of the context of the customer in this explosion of technologies and channels, he’ll offer a framework for keeping the consumer at the center of your marketing technology strategy. He’ll identify the decisions that affect this and alternative ways of architecting solutions to make them more human-focused. Laura Ramos, vice president and principal analyst at Forrester Research, will also address this re-framing of marketing technology through the lens of building a customer-obsessed enterprise. She’ll share examples of how leading firms have reinvented their approach to collaborative marketing and technology planning, implementation, and management — including the spread of agile operational principles throughout the organization. Corey Craig, Customer Experience Design & Innovation Lead at Dell, will share her experiences designing and operating “always on” marketing programs at scale. In theory, marketing automation technology has enabled these possibilities for many years, but it’s an entirely different challenge to figure out how to actually build behaviorally-driven, multi-vehicle nurturing campaigns across a variety of customer journeys. Corey will explain how to build a flexible content engine, how to organize your business rules to service sophisticated marketing automation logic, and how to create organizational alignment and adoption to create these new kinds of continuous — not merely episodic — customer experiences. Jeff Gothelf, a principal at Neo.com and author of the Jolt-Award-winning book Lean UX, will deliver a talk on how lean product design is the new marketing. Drawing on his extensive experience as a digital product designer for many the world’s leading brands, Jeff will present the concepts behind “lean UX” and how teams comprised of marketers, designers, product managers, and engineers can jointly develop a better understanding of customers and optimize customer experience in more of “continuous conversation” with the market. He’ll share how you can get started, the team structures that foster this approach, and the focus that helps such initiatives succeed. I’ve read Jeff’s book, and it’s terrific — I’m super-excited to hear him speak. Gerry Murray, research manager at IDC, will tackle the epic myth of left-brain vs. right-brain dichotomy head-on with a talk about leaps of imagination: creativity in a data and process-driven world. In this session, Gerry will illustrate how marketers can use the practice of “reframing” — revealing new meaning by changing context — to create breakthroughs in communication and creativity. He’ll give the audience four techniques for doing this and share a case study to demonstrate how it works in practice. Chris Goward, CEO of marketing optimization firm WiderFunnel and author of the terrific book, You Should Test That, will share a series of frameworks for experience optimization that will change the way you think about A/B testing and marketing experiments. Chris and I have shared the speaking circuit in conversion optimization circles for many years, and every time I hear him present, I come away inspired and impressed by his ideas and the eloquence by which he communicates them. The methods that he teaches for planning the right kinds of experiments are incredibly clear and actionable — I guarantee you will take away at least a half a dozen great hypotheses that you’ll want to test in your own customer experiences. While most of MarTech is about bridging the worlds of marketing and IT, there’s a similarly fascinating synthesis happening between marketing and sales. Jill Rowley, one of the true pioneering sales leaders of the marketing technology world and the leading champion of the “social selling” movement, will help connect the dots with what marketing and marketing technology have to do with social selling. The opportunity to apply marketing technologies to empower this new generation of sales — and in the process achieve a new level of sales and marketing alignment — is tremendous. This is a crucial channel of customer experience that shouldn’t be overlooked. And there’s no one better than Jill to illustrate it. Finally, we’ll close out this bundle with a really exciting talk by John du Pre Gauntt, an adjunct professor at the University of Washington and the principal of Media Dojo, on storytelling and the Internet of Things. I’d say that this session is forward-looking, as some of it may seem like science-fiction. But the reality is that the explosion of connected devices is happening today, and the new horizons that opens up for marketers, in both B2B and B2C contexts, is simply astounding. Marketing technologists will be at the forefront of these new kinds of customer experiences, and John will help prepare you for the first wave that’s upon us. Of course, at a marketing technology conference, you’d naturally expect some content on the technology itself. This third bundle of agenda topics is designed to provide you some unique perspectives on the evolution of the marketing technology landscape. The wonderful David Raab, one of the leading independent analysts and consultants in the marketing technology space — and author of the terrific Customer Experience Matrix blog — will examine the blossoming category of customer data platforms. David was one of the first people to identify and define this cluster of new technologies, and he’ll describe how they differ from earlier generations of marketing technology, how they fit into the overall martech landscape, and what the implications are for marketers. For a sneak preview, check out his post on Customer Data Platforms Revisited: The Future of Marketing Data. Jay Famico, the Practice Director of Technology at SiriusDecisions, will take us on a whirlygig tour of emerging marketing technologies, including customer advocacy management, customer journey mapping, and customer success management tools. Jay will explain how these new products fit into organizations, the opportunities they offer, and the pitfalls you can face in implementing them — and how to overcome them. We’ll close the agenda on Day 1 with a fireside chat between myself and three of the leading marketing cloud providers — Marketo, Oracle, and Salesforce — to discuss trends in 2015 for the major marketing platforms. Our special guest participants will include: Alexander Hooshmand, VP Product Management at Oracle; Chandar Pattabhiram, VP Product & Corporate Marketing at Marketo; and Eric Stahl, SVP Product Marketing at Salesforce. We’ll cover topics such as the evolution of the ISV ecosystems, the patterns they’re seeing across thousands of customers, and the innovations for the year ahead that they’re most excited about. Finally, we’ll wrap on Day 2 with a fireside chat between myself and three of the giants from the investment side of marketing technology: Neeraj Agarwal, General Partner at Battery Ventures; Brian Andersen, Partner at LUMA Partners; and Ashu Garg, General Partner at Foundation Capital. The topic will be: follow the martech money. Between them, these three gentlemen have been involved with funding or acquisition events for dozens of the best known marketing technology brands: Omniture, Marketo, Optimizely, Sprinklr, Bazaarvoice, Tealium, TubeMogul, Aggregate Knowledge, AdRise, Localytics, and more. We’ll discuss the patterns that they’ve seen in those successes, how the dynamics of the industry have been changing in recent years, and what they’re excited about for the years ahead. Rising above those three topic bundles, and in many ways tying them all together, I’m thrilled that we’ll have John Maeda deliver a keynote presentation for MarTech. He was the associate director of research at the MIT Media Lab, the president of the Rhode Island School of Design, and is currently the design partner at Kleiner Perkins Caufield & Byers and chairman of eBay’s Design Advisory Board. He’s spoken at TED and the World Economic Forum. He’s written numerous books, including The Laws of Simplicity and Redesigning Leadership. His artistic work is in the permanent collections of the Museum of Modern Art and the San Francisco Museum of Modern Art. He’s led the movement to transform STEM (Science, Technology, Engineering, and Math) to STEAM by adding Art. He was inducted into the New York Art Director’s Club Hall of Fame and received the AIGA Medal for his contributions to the field of graphic design and visual communication. And that’s just a brief bio. Having talked with John about our intersecting community of marketers and technologists, he’s excited to join us. I believe this will be a truly special keynote to remember. This will be the largest independent marketing technology event of its kind. It provides a terrific opportunity to see, in person, the solutions from a wide range of innovative companies. No matter how well you know this space, I am confident that you will make several fascinating new discoveries while wandering through this vibrant bazaar. In addition, Brightcove, Microsoft, SAP, and SnapApp will be hosting special lunch-and-learn sessions as “presenting sponsors,” to give you an even deeper view into the cool ideas they have to share. Whew, this post is already 3,500 words long, yet I still feel like I’ve only given you the briefest glimpse into what to expect at MarTech. We haven’t even talked about best part of the conference: you. You’ll have the chance to meet and mingle with hundreds of your peers in the marketing technology community — and that’s ultimately where the best learning and inspiration happens. We’ll provide two evenings of tasty libations to facilitate those networking discussions. And San Francisco is a pretty fun place for dinner excursions with new and old friends. What do you say? Will you join us? If your answer is “yes,” then I humbly suggest that you register now while seats are still available. I promise, you’ll be glad you came. Scott, what’s most interesting to me are the stories about transformation from marketing professionals, this appears to be a great conference, one that promises to bring together many leaders in the industry who can learn from one another and explore what’s happening today. How do you prepare for “what’s next” on the marketing technology horizon? This validates the seriousness of various marketing professionals attending the Martech conference. 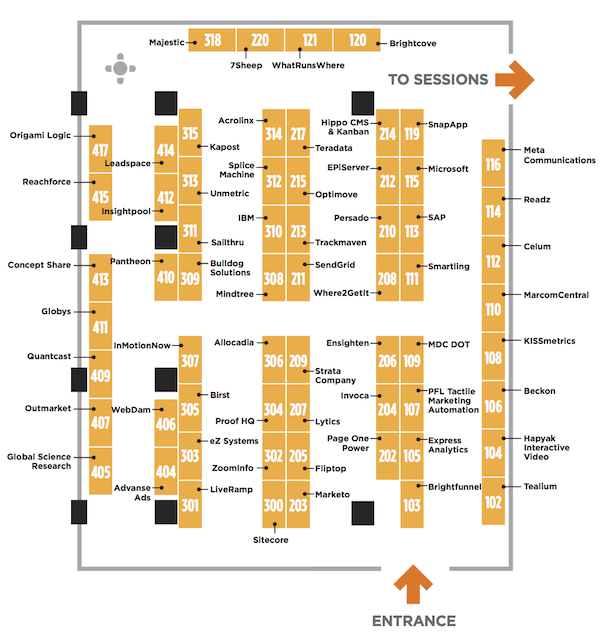 MarTech is one of those rare quality over quantity conferences. I do appreciate the varying perspectives which has been an undercurrent for success in the marketing technology space. After many years in the Agile movement, its great to see the Marketers embrace and own their technology. Agile Marketing will be a critical to the execution of Martech. CMO’s should embrace more of the Agile Manifesto to get the most from their teams: self-organization and continuous improvement. I think it’s great that you have all the marketing companies and speakers all in one place. There is going to be a lot of note taking and video recording going on. I am so sorry that I couldn’t get to this conference…. are you going to make the videos available? That’s what I’d love love to watch now. Or want to receive new articles via email? What will happen with marketing technology in 2015? What if 1,000+ marketing technology vendors were the new normal? Copyright © 2008-2019 Scott Brinker. All rights reserved.